[183 Slides Report] Acetic acid is an organic compound with molecular formula CH3COOH, and is a precursor for manufacturing various other chemicals that serve various end user industries, such as textiles, inks, rubbers, plastics, and others. Its main application segments include the manufacturing of vinyl acetate monomer (VAM), purified terephthalic acid (PTA), acetic anhydride, and ester solvents (ethyl acetate & butyl acetate). The acetic acid market has grown considerably during the past few years and is estimated to grow at a considerable pace in the next five years, mainly driven by the growing demand in the Asia-Pacific region. Asia-Pacific is the biggest consumer of in the industry, which consumed around 61.77% of the total global demand in 2012, followed by North America with a considerable demand. China is the biggest consumer, and is also among the fastest growing markets with an estimated CAGR of about 5.67% from 2013 to 2018. The European and North American markets are comparatively mature with a demand growth well below the average market growth. ROW is the fastest growing market with a CAGR of about 6.68% during the forecasted period. This study basically aims at estimating the global acetic acid market and its derivatives for 2013 and to project the expected demand of the same by 2018. This market research study provides a detailed qualitative and quantitative analysis of the global industry. It provides a comprehensive review of important market drivers, restraints, opportunities, winning imperatives, challenges, and key issues. The market is further segmented and projected for regions, such as Asia-Pacific, North America, Europe and ROW, which is further segmented for key countries in each region. We have used various secondary sources, such as encyclopedia, directories, and databases to identify and collect information useful for this extensive commercial study of the market. The primary sources - experts from related industries and suppliers - have been interviewed to obtain and verify critical information as well as to assess the future prospects of acetic acid and its derivatives. The competitive scenarios of top players in the acetic acid and its derivatives market have been discussed in detail. We have also profiled leading players of this industry with their recent developments and other strategic industry activities. These include: BP Plc (U.K.), Celanese Corporation (U.S.), Eastman Chemical Company (U.S.), Daicel Corporation (Japan), Jiangsu Sopo (Group) Co. Ltd. (China), LyondellBasell Industries N.V. (The Netherlands), Shandong Hualu-Hengsheng Chemical Co. Ltd. (China), Shanghai Huayi (Group) Company (China), Yankuang Cathay Coal Chemicals Co. Ltd. (China), and Kingboard Chemical Holdings Ltd. (HongKong). This research report categorizes the global acetic acid market on the basis of applications and geography along with forecast of volume, value, and analyzing trends in each of the submarkets. It also contains the market for various derivatives of this acid at country level. On the basis of applications: The acetic acid market is segmented on the basis of industry applications, such as vinyl acetate monomer, purified terephthalic acid, acetic anhydride, and ester solvents (ethyl acetate & butyl acetate). Each application is further described in detail in the report with volume and value forecasts for each application. On the basis of geography: A country level segmentation is done for both acetic acid and its derivatives for regions segmented as Asia-Pacific, North America, Europe, & ROW; and further for key countries in each region that include the U.S., Canada, Mexico, Germany, U.K., Belgium, Spain, Russia, China, Japan, South Korea, India, Taiwan, Brazil, and Saudi Arabia. Acetic acid market is expected to reach at an estimated volume of 16,339.67 kilotons by 2018, signifying a firm annualized growth rate of over 4.48% from 2013 to 2018. The global market, along with its various derivatives, has witnessed a significant growth in the recent years, and this growth is estimated to persist in the coming years. It is a key building block to manufacture various chemicals, such as vinyl acetate monomer (VAM), purified terephthalic acid (PTA), ester solvents(ethyl acetate & butyl acetate), and acetic anhydride that are further used by a wide range of end-user industries, such as synthetic fibers, textiles, inks, and pesticides. Currently, Asia-Pacific is the largest market and all of its downstream derivatives, which consumed more than 60.00% of the overall global consumption in 2012. Among all the countries, China dominates the market. The country consumed maximum volume of this product in 2012. 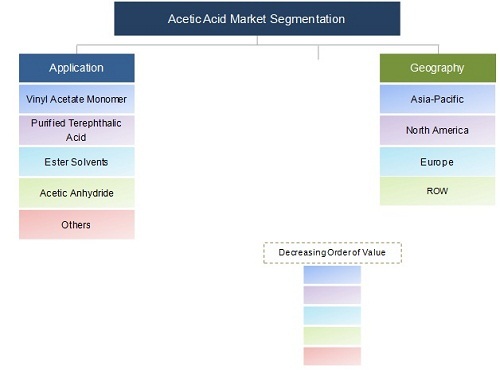 The market volume of acetic acid and its various derivatives is comparatively low in the ROW region, but is estimated to grow at the highest CAGR from 2013 to 2018, followed by the Asia-Pacific region. The overall demand in the industry is driven by the producers of vinyl acetate monomer (VAM), purified terephthalic acid (PTA), and ester solvents consuming almost 73.00% of the total demand in 2012. Ester solvents manufacturing segment is expected to be the strongest growth segment of the market, which is primarily driven by the growing demand from coatings industry. Subsequently, the budding textile and packaging industry is pushing the demand for PTA, which in turn is driving the demand for acetic acid at a notable pace. Among all the acetic acid derivatives, VAM led the market with the highest global consumption of more than 5.0 million tons, followed by ester solvents with total global consumption of around 4.0 million tons in 2012. The top manufacturers include BP Plc (U.K.), Celanese Corporation (U.S.), Eastman Chemical Company (U.S.), Shanghai Huayi (Group) Company (China), Daicel Corporation (Japan), LyondellBasell Industries N.V. (The Netherlands), Shandong Hualu-Hengsheng Chemical Co. Ltd. (China), Yankuang Cathay Coal Chemicals Co. Ltd. (China), Jiangsu Sopo (Group) Co. Ltd. (China), and Kingboard Chemical Holdings Ltd. (HongKong). This report covers the acetic acid market by various regions and key countries in each region. It also provides a detailed segmentation of the industry based on important applications, along with its projection till 2018. The country level demand estimations and forecast of important derivatives of acetic acid are also provided in the report.